Draft: 2007, New York Mets, 7th rd. Full name is Lucas Christopher Duda...resides in Riverside, Calif. during the offseason ... Graduated from Arlington High School in Riverside, Calif., in 2004...named California Interscholarstic Federation Division I Player of the Year as a senior, batting .493 with nine homers and 33 RBI ... A member of the 2004 CIF Division I Championship team...earned the save at Dodger Stadium in the championship final ... Played three years at the University of Southern California...hit seven home runs and drove in 34 during his junior campaign ... Played for the MLB All-Star team that toured Japan following the 2014 season...teammates with current Royal Salvador Perez. Signed with the Royals as a Major League free agent on Feb. 28 and played in 87 games, hitting 13 home runs and collecting 48 RBI…acquired by Atlanta on Aug. 29 for cash considerations, where he went 4-for-18 with a homer and four walks ... Homered in his first at-bat on Opening Day, hitting a three-run shot off former Royal James Shields… according to Elias, he became the fifth player to homer in his first at-bat with Kansas City, joining Adam Moore (2012), Calvin Pickering (2004), Yamil Benitez (1997) and Jon Nunnally (1995)…became the sixth Royal to homer in the first inning on Opening Day, joining: Alex Gordon (2009), Joe Randa (1999), George Brett (1988), Onix Concepción (1984) and Amos Otis (1977) ... Missed over five weeks of action, being placed on the disabled list on May 14 (right foot plantar fasciitis)… reinstated on June 23, which included a four-game rehab stint with Omaha (AAA) ... Recorded an eight-game hitting streak (May 9-June 25), in which he hit .367/.406/.700 (11-for-30) with four doubles, two homers and six RBI ... Finished the year batting .264 (63-for-239) off right-handed pitching, compared to .180 (16-for-89) vs. lefties. Split the season between the New York Mets and Tampa Bay, being traded to the Rays on July 27 in exchange for RHP Drew Smith ... Hit 30 home runs (17 with New York, 13 with Tampa Bay) combined between the two stops to match his previous career best (2014)...25 of his 30 dingers came against righthanded pitching ... Collected 58 extra-base hits (28 doubles, 30 homers), accounting for 63.0 percent of his total hits, which ranked second in the Majors behind only Joey Gallo (65.9 percent) ... At the time of the trade, led the Mets in doubles (21) and ranked second in slugging (.532) and third in homers (17), walks (37) and OBP (.347) ... Slugged .525 (21 doubles, 25 homers) vs. righties ... Homered in each of his first two games with the Rays (July 28-29) at Yankee Stadium...became the second Rays player to homer in each of his first two games with the team, joining Elijah Dukes in 2007 ... Batted .286/.414/.664 (34-for-119) with two outs...that included 12 doubles, 11 homers and 29 RBI ... Homered nine times in a stretch of 21 games (19 starts), between Aug. 15 and Sept. 10...however, he was just 4-forhis-last-40 (.100), from Sept. 15 on ... Matched a career high with four hits on April 11 at Philadelphia, going 4-for-6 with a double and two homers... it also marked the seventh time he's recorded three extrabase hits in a game, while he did it an eighth time later in the year, June 23 at San Francisco (2 doubles, 1 homer). Underwent surgery to repair a left core muscle injury on October 13 at the Hospital for Special Surgery… Also underwent right wrist surgery on November 14 at the Hospital for Special Surgery...Played in 47 games for the Mets during the regular season after missing much of the season with a stress fracture in his lower back...Was placed on the 15-Day Disabled List with a stress fracture in his lower back on May 23 (retroactive to May 21)...Transferred to the 60- Day Disabled List on August 12 and activated from the DL on September 17...Homered in three consecutive games from April 18-20 at Philadelphia...Was the second time in his career he's homered in three straight (the other time was September 25-29, 2015)...Recorded his only multi-homer game of the season on May 4 vs. Atlanta...Has 14 career multi-homer games, which is sixth all-time for a Met...Dave Kingman is fifth with 16 such games...Batted .231 (30-130) with seven home runs and 19 RBI in 39 games before going on the DL...Batted .217 (5- 23) in eight games after being activated off the DL on September 17. Set a career-high in doubles with 33 and had his second straight season with 20 or more doubles and home runs....Had seven multi-home run games, the second-most in the majors behind Chris Davis (eight)...It was also tied for the most in franchise history for a single-season with Carlos Delgado (2008) and Dave Kingman (1976)....Finished tied for 10th in the NL with 27 home runs....Hit a career-high seven home runs off lefthanded pitching, surpassing his previous total of four from 2012... Was on the 15-Day Disabled List from August 22-September 6 (lower back stiffness)...Named NL Co-Player of the Week for the week of July 27 August 2 with teammate Noah Syndergaard...Hit .474 (9-19) with seven home runs and 10 RBI during the week to earn the award...Was his first career NL Player of the Week award... 19 of his 27 home runs came at Citi Field...Is the park's all-time leader in home runs (56)....His 101 career home runs as a Met are the 12th most in franchise history... Is one of six players whose first 100 homers in the majors have all come with the Mets; he joins Ed Kranepool (hit first 100 home runs spanning 1963-1976), Darryl Strawberry (1983-1986), Todd Hundley (1991-1997), Edgardo Alfonzo (1995-2001) and David Wright (2004-2008)... Went three straight games (April 14-16) with two extra-base hits, tied for the longest streak in team history with Carlos Beltran (2006), Rico Brogna (1994), Lenny Dykstra (1987) and Frank Thomas (1962)...Had five doubles, one home run and six RBI over those three games... Batted .325 (26-80) in April, his highest average for any calendar month during his career....Hit his first career grand slam in the first inning on September 26 at Cincinnati to help the Mets clinch the NL East title...Had two, three-run home runs on September 25 at Cincinnati...Became the first player in Mets history to hit three home runs with at least two runners on base over a two-game span in team history...The only other major league players to do this in the last 10 years are Jim Thome in July 2009 and Cody Ross in July 2012....Picked up his fourth career walk-off RBI on June 27 vs. Cincinnati...His last came on September 27, 2014 (walk-off home run to beat Houston). ... Hit .163 (25-153) from June 1-July 22 with three home runs and 13 RBI (42 games).... Went 3-for-3 with three home runs on July 29 vs. San Diego...Became the 11th player in franchise history to hit three home runs in a game and the second player in franchise history to do it at home...Joined Kirk Nieuwenhuis as the only players in franchise history to hit three home runs in a home game... Hit nine home runs in eight games dating from July 25-August 2...Had eight straight hits go for home runs from July 25-August 1...That set a franchise record and it was the first time an MLB player did it since Marcus Thames of Detroit accomplished it in 2008....Had 10 straight extra-base hits that drove in a run from July 25-August 2 (nine home runs and one double)...The last major leaguer to have such a streak was Cleveland's Travis Hafner in 2005....Played two major league rehabilitation games with Binghamton (AA) of the Eastern League... Went 3-for-6 (.500) in the two games. Was the first player with multi-hit games in his first two career World Series games since Shane Victorino (2008)... Had six RBI in the NLCS...Went 3-4 with two doubles, a three-run first inning home run and five RBI in Game 4 of the NLCS at Chicago...The five RBI tied the club single-game postseason record (fifth time)...Gary Carter (1986 World Series Game 4 at Boston) is the only other Met with three extra-base hits in a postseason game. Set career-high totals in almost every offensive category, including home runs (30) and RBI (92)...Finished third in the NL with 30 home runs...Was one of 11 major leaguers to reach the 30-home run plateau...Became the 17th player in franchise history to hit at least 30 home runs in a season and the first since Ike Davis in 2012...Hit his 30th home run in his last at-bat of the season (Michael Foltynewicz), becoming the first player in franchise history to get to 30 home runs in the team's final game of the season...Mike Cameron reached the mark in the next to last game of 2004...Became the fourth Mets first baseman to hit 30 home runs in a season...Carlos Delgado (38 in 2006, 38 in 2008), Dave Kingman (37 in 1982) and Ike Davis (32 in 2012) also did it...Became the Mets' sixth lefthanded batter to reach the mark, joining Darryl Strawberry (three times), Delgado (two times), Cliff Floyd (one time), Davis (one time), and Robin Ventura (one time)...His 92 RBI tied for fifth in the league...That total is the most by a Mets player since David Wright drove home 93 in 2012...Led the Mets with 13 game-winning RBI...Also paced the team with a .301 (37-123) batting average with runners in scoring position...Hit his first career walk-off home run, a two-run shot, September 27 vs. Houston (Tony Sipp)...It was his third game-ending RBI...The home run came with two outs and the Mets down 1-0...The last time the Mets hit a game-ending, two-out home run while trailing was June 11, 2005...Down 3-2, Cliff Floyd hit a three-run, two-out home run in the 10th inning off the Angels' Brendan Donnelly...It was also the second game-ending home run in franchise history when the team was trailing and being shut out...Duke Snider hit the other one on May 30, 1961, in the game two of a doubleheader vs. Chicago (NL). Had 53 of his 57 extra-base hits against righthanders...Hit .180 (20-111) with two doubles and two home runs against lefties...Hit two, two-run home runs on April 4 vs. Cincinnati (Mike Leake, 2) for his fifth career multi-home run game and fourth at Citi Field, which is tied for the most in the ballpark's six-year history with Ike Davis...Snapped an 0-13 (0-6 in 2014) skid dating to 2013 with his two home runs...It marked the first time a Mets player's first two hits on the season were home runs since 2012, when Duda also did it...Had his second multi-home run game of the season and sixth of his career on August 24 at Los Angeles (NL) (Kevin Correia and Jamey Wright)...Finished with a career-best five RBI...Went 4-5 with two RBI on April 14 at Arizona...The four hits tied his career high, and it was his fourth four-hit game of his career and first since June 17, 2013 at Atlanta...Hit home runs in consecutive games on June 25-26 for the first time since May 30-June 1, 2012...Homered in consecutive games four more times, including the last two games of the season...Hit a two-run home run in the 11th inning on June 1 at Philadelphia in a 4-3 win...It was his first extra-innings home run of his career and snapped an 0-16 skid in extra-innings...Hit his second career pinch-hit home run, June 25 vs. Oakland (lefthander Brad Mills)...Finished with 15 June extra-base hits, tied for the third most in the NL...His .576 slugging percentage ranked fifth best among league qualifiers for June...Drove in a run in a career-high and team season high-tying seven straight, July 24-August 1 (11 total)...Hit 14 home runs at Citi Field, giving him 37 for his career at the ballpark, the second most in the park's six-year history...David Wright leads (46)...Played for the MLB All-Star team that faced Japan's All-Stars, November 10-November 20...Went 4-10 (.400) with two doubles...Played leftfield and first base. Made his third consecutive Opening Day roster...Also spent time on the 15-Day Disabled List and at Las Vegas (AAA) of the Pacific Coast League. Hit two home runs (off Kyle Kendrick & Mike Adams) on April 10 at Philadelphia for the third multi-home run game of his career...Added a double for his second career game with three extra-base hits...Finished the season with a career high-tying 15 home runs, first set in 2012. Had his second two-home run game of the season and fourth of his career on April 19 vs. Washington (off Stephen Strasburg & Drew Storen)...Thirteen of his 15 home runs were solo shots and six of his home runs either gave the Mets a lead or tied the game. Hit his seventh home run of the season on May 8 vs. Chicago-AL (off Jake Peavy) in his 28th game...Did not reach seven home runs in 2012 until his 49th game. Hit in a career-best 10 straight games from May 16-May 26 (.351, 13-37). Collected his second career game-ending RBI on May 28 against the Yankees' Mariano Rivera...Became the fourth Mets player with a walk-off RBI against the Yankees (Matt Franco, July 10, 1999; David Wright, May 19, 2006; Jason Bay, July 3, 2011). Hit his 10th home run on June 2 at Miami, becoming the fifth player in Mets history with double-digit home runs in at least three straight seasons starting as a rookie. Finished with a career high-tying four hits, June17 at Atlanta...It marked his third four-hit game, last September 16, 2011, also at Atlanta. Placed on the 15-Day Disabled List on June 23, with left intercostal strain...Reinstated on August 7 and was optioned to Las Vegas (AAA)...Hit .306 (19-62) with no home runs and eight RBI in 18 games for the 51s. Recalled on August 24. Hit .196 (18-92) with four home runs and 10 RBI in his second stint with the Mets (31 games, 26 starts)...Compiled a .348 onbase percentage (17 walks, five hit-by-pitches). Made his second consecutive Opening Day roster...Optioned to Buffalo(AAA) of the International League on July 24...Returned to New York onAugust 26...Hit .241 (74-307) with 12 home runs and 44 RBI in 89 gamesduring his first stint with the team...Went 22-94 (.234) with three homeruns and 13 RBI in 32 games after returning to the active roster...Set career-high totals in games, at-bats, runs, hits, home runs, RBI and walks...Finished with 10 game-winning RBI, the third-most on the team...Hit his first career multi-home run game in the second game of the seasonvs. Atlanta...Went deep off of Jair Jurjens and Chad Durbin...Also hit two home runs on May 30 vs. Philadelphia (off Cliff Lee and RaulValdes)...The drives were his first career home runs against lefthanders...Hit in six straight (.364, 8-22), May 30-June 5...Hit four home runs anddrove in nine over that stretch...Drove in a career high-tying four runs twice: April 28 at Colorado and June1 vs. St. Louis...He set the mark on June 25, 2011 at Texas, his only otherfour-RBI game...Hit in a career high-tying seven straight games, June 16-June 24...Hit .333(9-27) during the run...Tied his career-best with three walks on June 27...Hit a go-ahead two-run home run, August 29 at Philadelphia...Eight of his15 home runs either tied the game or gave the Mets a lead...Had multiple hits in three straight games, September 12-September 15,tied for the longest such streak of his career...Hit .500 (6-12) during thestretch...Made starts at first base (six appearances, four starts), leftfield (24appearances, 23 starts) and rightfield (81 appearances, 77 starts)...All hisgames in leftfield came after his recall from Buffalo...Hit .260 (25-96) with three home runs and eight RBI in 25 games for theBisons. Finished among the NL rookie leaders in several categories: on-base percentage and slugging percentage (first), battingaverage (second), home runs (fourth), RBI (fifth), runs and hits (sixth), at-bats and doubles (seventh), and games (eighth)...Hit .317 (82-259) with 19 doubles, 10 home runs and 46 RBI overhis last 80 games, dating back to June 22...His .317 average was eighthbest in the NL among players with at least 250 at-bats from thattime span through the end of the year...Collected a career-high four hits twice, June 25 at Texas andSeptember 16 at Atlanta...Went 4-5 both times...Also had a personalbestfour RBI in the June 25 game at the Rangers...Had threedoubles on June 25 to equal the franchise mark, last done by JoseReyes on May 13, 2009 vs. Atlanta...Finished with a team-best 10 home runs after the All-Star break...Became one of six rookies in team history with double-digit homeruns after the break and the first since Mike Jacobs in 2005(11)...Ranked fifth among rookies in franchise history with 38second-half RBI...The four hits and four RBI on June 25 made Duda the seventh Metsrookie to have at least four hits and four RBI in the same game(Wayne Garrett, 1969; Gregg Jefferies, 1989; Jeromy Burnitz, 1993;Tim Bogar, 1993; Benny Agbayani, 1999; Mike Jacobs, 2005)...Made his first Opening Day roster...Optioned to Buffalo (AAA) ofthe International League on April 10...Recalled on May 3, butoptioned back to Buffalo on May 5...Returned to New York for theremainder of the season on June 10...Played his final game of the year on September 21 at St. Louis...Leftthe game after hitting his head when colliding with the outfield wall...Played first base for the first time in his major league career on June11 at Pittsburgh...Made the start and went 1-4 with a double...Stole his first career base on April 10 vs. Washington...Swiped secondoff Jason Marquis and Ivan Rodriguez...Collected the first triple of his career on June 30 at Detroit...Hit his first career pinch-hit home run on July 23 at Florida (off LeoNunez)...Collected his first walk-off RBI with a two-run single on August 8 vs.San Diego that gave the Mets a 9-8 win...Hit a home run in consecutive games for the first time in his careeron August 14 at Arizona (off Jason Marquis) and August 15 at SanDiego (off Aaron Harang)...Hit .302 (39-129) with 10 home runs and 24 RBI in 38 games forBuffalo (AAA) of the International League. Was named the Sterling Organizational Player of the Year...Finished theseason tied for the Mets minor league lead in home runs...Was awarded the Stan Barron MVP Award from the Buffalo Bisons onSeptember 2...Had his contract selected by the Mets on September 1...Collected his first major league hit on September 3 at Chicago...The RBIdouble off Randy Wells tied the game at 4-4 in the sixth inning...Hit his his first major league home run on September 17 vs. Atlanta...It wasa solo home run off Tommy Hanson...Began his major league career 1-34 (.029)...Hit .314 (16-50) to end theseason...Ten of his 17 hits with the Mets went for extra bases...Hit four home runsover his last 12 starts...Began the season with Binghamton (AA) of the Eastern League...Collected a season-high six RBI on April 16 at New Hampshire...Promoted to Buffalo (AAA) of the International League on June 14...During his time with Buffalo, he led the International League with 42extra-base hits...Hit over .300 in all three months with Buffalo...Hit nine of his 17 home runsin 26 July games...Tied the all-time Buffalo franchise record by hitting a home run in fiveconsecutive games from June 28-July 2...Had 25 multi-hit games in 70 games with Buffalo...Also had 15 games withmultiple RBI...Scored a run in eight straight games (11 overall) from August 2-August 10. Spent the season with Binghamton (AA) of the Eastern League beforehaving his season cut short due to a right knee strain which forced him tothe Disabled List on August 13...Hit .320 (88-275) with nine home runs and 46 RBI against righthanded pitchers...Finished second on his team in RBI and tied for second in home runs...Hit in 19 straight games from July 1-July 21...Hit .342 (25-73) with six doubles, two home runs and 11 RBI over thatspan...Made 48 starts at first base, 41 in leftfield and appearned 19 games as the designated hitter with the B-Mets. Spent the entire season with St. Lucie (A) of the Florida State League...Led the team in hits, doubles, home runs, RBIand games played...Collected the first four-hit performance of his professional career with a 4-5 effort on April 17 at Brevard County...Alsocollected four RBI in that game. Spent his first professional season with Brooklyn (A) of the New York-Penn League...Set a franchise record with a 17-game hitting streak from August 16-September 2....Hit .438 (28-64) over that span...Went 2-4 in the first game of the playoffs against the Staten Island Yankees including a two-run home run that tied thegame at 4-4 and a two-RBI single in the ninth inning that led the Cyclones to an 8-4 win. March 25, 2019 Kansas City Royals selected the contract of 1B Lucas Duda from Omaha Storm Chasers. March 22, 2019 Kansas City Royals signed free agent 1B Lucas Duda to a minor league contract. March 22, 2019 1B Lucas Duda assigned to Omaha Storm Chasers. March 20, 2019 Minnesota Twins released 1B Lucas Duda. March 20, 2019 Rochester Red Wings released 1B Lucas Duda. February 9, 2019 Minnesota Twins signed free agent 1B Lucas Duda to a minor league contract and invited him to spring training. February 9, 2019 1B Lucas Duda assigned to Rochester Red Wings. October 29, 2018 1B Lucas Duda elected free agency. 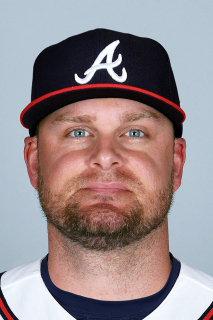 August 30, 2018 Atlanta Braves activated 1B Lucas Duda. August 29, 2018 Kansas City Royals traded 1B Lucas Duda to Atlanta Braves for cash. June 23, 2018 Kansas City Royals activated 1B Lucas Duda from the 10-day disabled list. June 18, 2018 Kansas City Royals sent 1B Lucas Duda on a rehab assignment to Omaha Storm Chasers. February 28, 2018 Kansas City Royals signed free agent 1B Lucas Duda. November 2, 2017 1B Lucas Duda elected free agency. July 28, 2017 Tampa Bay Rays activated 1B Lucas Duda. July 27, 2017 New York Mets traded 1B Lucas Duda to Tampa Bay Rays for RHP Drew Smith. May 12, 2017 New York Mets activated 1B Lucas Duda from the 10-day disabled list. April 28, 2017 New York Mets sent 1B Lucas Duda on a rehab assignment to St. Lucie Mets. April 21, 2017 New York Mets placed 1B Lucas Duda on the 10-day disabled list retroactive to April 20, 2017. Hyperextended left elbow. October 6, 2016 New York Mets activated 1B Lucas Duda. October 5, 2016 New York Mets reassigned 1B Lucas Duda to the minor leagues. September 17, 2016 New York Mets activated 1B Lucas Duda from the 60-day disabled list. August 10, 2016 New York Mets transferred 1B Lucas Duda from the 15-day disabled list to the 60-day disabled list. Stress fracture of the lower back. May 23, 2016 New York Mets placed 1B Lucas Duda on the 15-day disabled list retroactive to May 21, 2016. Stress fracture of the lower back. September 7, 2015 New York Mets activated 1B Lucas Duda from the 15-day disabled list. September 5, 2015 New York Mets sent 1B Lucas Duda on a rehab assignment to Binghamton Mets. August 24, 2013 New York Mets recalled 1B Lucas Duda from Las Vegas 51s. August 7, 2013 New York Mets optioned LF Lucas Duda to Las Vegas 51s. August 5, 2013 New York Mets sent LF Lucas Duda on a rehab assignment to Las Vegas 51s. July 29, 2013 New York Mets sent LF Lucas Duda on a rehab assignment to St. Lucie Mets. July 24, 2013 New York Mets sent LF Lucas Duda on a rehab assignment to GCL Mets. June 23, 2013 Lucas Duda roster status changed by New York Mets. August 26, 2012 New York Mets recalled Lucas Duda from Buffalo Bisons. July 24, 2012 New York Mets optioned Lucas Duda to Buffalo Bisons. June 10, 2011 New York Mets recalled Lucas Duda from Buffalo Bisons. May 27, 2011 Lucas Duda roster status changed by Buffalo Bisons. May 11, 2011 Buffalo Bisons placed LF Lucas Duda on the 7-day disabled list. May 5, 2011 New York Mets optioned LF Lucas Duda to Buffalo Bisons. May 3, 2011 New York Mets recalled Lucas Duda from Buffalo Bisons. April 11, 2011 New York Mets optioned Lucas Duda to Buffalo Bisons. September 1, 2010 New York Mets selected the contract of Lucas Duda from Buffalo Bisons. June 14, 2010 Lucas Duda assigned to Buffalo Bisons from Binghamton Mets. June 1, 2010 Lucas Duda roster status changed by Binghamton Mets. May 14, 2010 Binghamton Mets placed OF Lucas Duda on the 7-day disabled list. Strained right hamstring. October 23, 2009 Surprise Rafters reassigned OF Lucas Duda to the minor leagues. October 6, 2009 OF Lucas Duda assigned to Surprise Rafters. September 29, 2009 Binghamton Mets activated OF Lucas Duda from the 7-day disabled list. August 14, 2009 Binghamton Mets placed 1B Lucas Duda on the 7-day disabled list retroactive to August 13, 2009.